WATERFRONT reserve cottage: Self-contained, 4 bedroom, air-conditioned,. Sleeps 8. PETS welcome at owners discretion. LINEN can be supplied if requested, for an extra charge of $10 per person. Free WiFi. Don't forget to bring your subscriptions for Netflix/Stan etc! A large level grassy garden leads down to the lakes edge, where it is ideal swimming for children, splendid fishing, sailing, boating, kayaking, canoeing, prawning and windsurfing. The cottage has the added advantage that there are no other residents - you have the whole property to yourselves. You have PRIVACY. The rear veranda faces west, overlooking the lake - an ideal spot to watch the spectacular SUNSETS. What a great outlook to enjoy a BBQ! The cottage has a master bedroom with a queen. It also has second bedroom with two singles. The downstairs the 3rd bedroom is an ideal second living area with a queen bed + a single + a lounge, TV&DVD. The 4th bedroom has a single bed and a lounge. These bedrooms have access to the en-suite which is in the laundry and are not air-conditioned. They usually always have a very temperate temperature as they capture the breezes from every direction. It is freshly painted and has a new kitchen - dishwasher, upright stove/oven, fridge, microwave. It has a new second bathroom/laundry downstairs - vanity,shower and toilet. The bathroom upstairs has a shower, vanity and toilet. There is also the good Aussie outhouse toilet in the back garden - 3 toilets in total! And an outside shower. The cottage is close to many other amenities - restaurants, Country Club, golf courses, tennis courts, boat hire, bike hire, boat ramps, national and marine parks, fishing & diving charters, whale and dolphin cruises, wineries, air and naval museums and Shoalhaven ZOO. Your stay includes a 20 percent off DISCOUNT VOUCHER on whale/dolphin cruises. LINEN is supplied for an extra charge of $10 per person. If you would like your beds made up please request this on booking. Otherwise, you need to bring your sheets, pillowslips and towels. 30 minutes south of Nowra on the shores of the clear sandy waters of the pristine, salt water lake, of St Georges Basin and only 7 minutes to the spectacular JERVIS BAY Marine Park. Close to the village of Huskisson and the famous Hyams Beach. SWIMMING, KAYAKING, BOATING, FISHING, PRAWNING, SAILING, SURFING, KAYAKING, KITE SURFING, CYCLE WAYS, WINDSURFING, SNORKELING, SCUBA DIVING, WHALE/DOLPHIN/SEAL & BIRD WATCHING, NATIONAL PARKS, BOTANICAL GARDEN, GOLF, TENNIS, COUNTRY CLUB, AWARD WINNING RESTAURANTS AND WINERIES, AIR MUSEUM at Nowra Hill, MARITIME MUSEUM at Huskisson, ABORIGINAL ARTIFACTS SHOP, GALLERIES, Shoalhaven ZOO in north Nowra and the pristine Jervis Bay Marine Park with it's beautiful beaches, walking/cycling tracks and picnic areas . I am a semi- retired science teacher. I love the natural world and travelling, particularly to outback Australia. I grew up in a sea side suburb of Sydney and was transferred to a Shoalhaven school. I always wished to live near Jervis Bay and St Georges Basin, so my wish came true. Back in 1973, I helped my parents choose this property and in 1975 they built the main house. It was to be their retirement home. 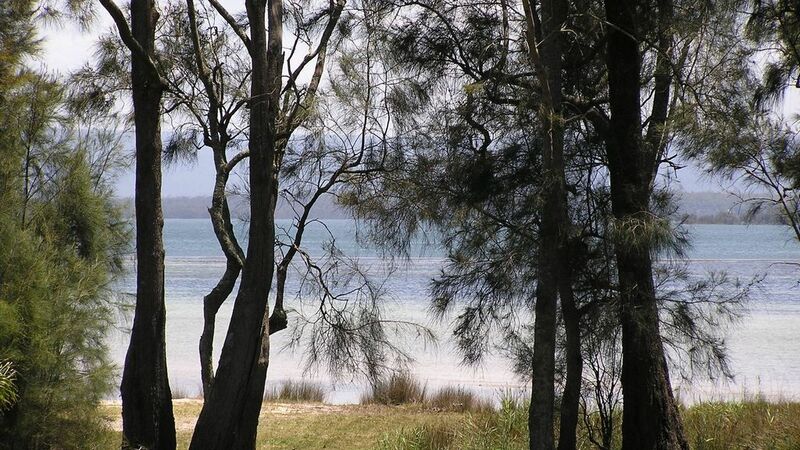 We initially chose the property for its beautiful position - view, level grassy garden down to the waters edge, ideal for the tinny and most water sports and also it's close proximity to the beaches and national parks of Jervis Bay. Only a 7 minute drive to the pristine Jervis Bay Marine Park. Reverse cycle air- conditioner in the main living area Convection heater for downstairs living area and bedrooms. If requested, for an extra charge of $20 per person, your beds will be freshly made. Request this service when booking. Or you will need to bring your own sheets, pillowslips and towels. Parking space for 3/4 vehicles and boat. There are 2 carports which will fit 3 medium sized cars. Bath mats, hand towels and tea towels are provided. Bath towels are only provided if the linen service is requested. FREE bring your Netflix/Stan subscription passwords. Also 30 free movies. There are 2 indoor living areas and an outdoor BBQ setting. Electric ceramic glass 4 burner cooktop with a separate grill and oven. Boutique plunger coffee and plunger supplied. Salt , pepper and sugar supplied. Fully self contained. You just need to bring your food. A 6 seater dining table. 3 more chairs are there for use. 2 TVs both with DVD consoles. In main living area. Radio + ipad dock in second living area. A small number of books are provided upstairs and a large selection is downstairs. Several board games and card games are supplied. Large, fully enclosed, grassy and level with a great view. Balcony and outdoor living area has views over the lake to the mountains to the west with some of the best eunsets you will ever see. Bring your own or hire from Jervis Bay Kayaks (will deliver). The lake awaits you at the end of the garden. Are available for hire from the nearby Bike shop in Sanctuary Point shopping center. Bring your own - plenty of parking on the property or hire from Boab. Relax with a great view and watch the incredible sunsets over the lake and mountains. Hire from Dive Jervis Bay at nearby Huskisson or Jervis Bay Kayaks, also at Huskisson. Also hire BIKES from bike shop Sanctuary Point to ride on our great bike tracks around Jervis Bay. Is 250m walk from the property at St Georges Basin Country Club. 2 x 18 hole golf courses are nearby. One is 250m walk from the property at St Georges Basin Country Club. The other is a 10 minute drive to Vincentia Golf Club. Paradise Bungalow at Sanctuary Point provided us with a wonderful couple of days in paradise. Lots if rain during our stay, but we managed to do some great trips in the sailing kayaks on St Georges Basin. The large, fenced and grassy yard provided plenty of room for the trailers and to rig the kayaks. A short stroll from the gate on the waterfront reserve led to a neat grassy bank from which to launch the kayaks. The house was very clean with splendid water and bush views from the peaceful first floor veranda. We very much enjoyed our short stay and look forward to our next opportunity to holiday in the Paradise Bungalow. We thoroughly enjoyed our stay. The property was very clean and well equipped. Lovely outlook from the deck and is situated on the waterfront. We found Paradise Bungalow very well presented and totally suitable for us beachgoers and our dog. We found Paradise Bungalow very well presented and totally suitable for us beachgoers and our dog. The shower on the ground level meant that we could rinse off the beach salt and sand and hang up our towels before setting foot inside. The house was very well kitted out. We were all very comfortable and thoroughly enjoyed our stay.The view of the water and pleasant walk along the shore all added to the value - not to mention the sunsets viewable from the lounge/dining room.My only hesitation is the A/C which worked but struggled somewhat in the peak of the summer heat.Will we come back? - Certainly!